The 1956 United States presidential election in Texas took place on November 6, 1956. 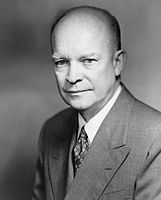 Incumbent President Eisenhower won his birth state of Texas with 55 percent of the vote, giving him twenty-four electoral votes. He won a second term in the general election. Eisenhower would become the first Republican to carry Texas twice, having won the state in 1952 as well. ^ These write-in votes were not listed by county but only as a statewide total. This page was last edited on 14 December 2018, at 17:24 (UTC).